The hottest student job on campus features a huge audience, an expansive workplace, and very challenging odds: 10 to 1 against getting hired, because a lot of people vie for the post. The Yale Visitor Center and the Office of Undergraduate Admissions recently completed hiring the new class of campus tour guides, a months-long process that winnows the roughly 120 applicants down to 15–20 new hires to replace the senior guides who graduate each year. The 60 current tour guides recently gathered in a day-long session at the Greenberg Center for final discussions and final voting on each candidate. Applicants must undergo an initial interview, do an audition tour, and then pass a final consensus vote from all the current guides. The process is steered by Nancy Franco, director of the Yale Visitor Center, and Mark Dunn, director of outreach and recruitment in the Undergraduate Admissions Office. Current student guides are involved in each part of the screening. 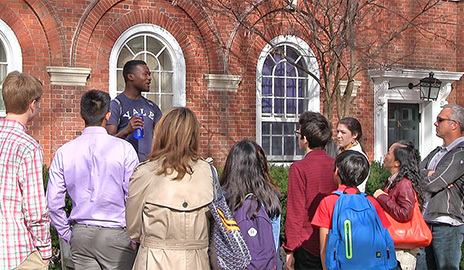 Free undergraduate-led tours of the campus are offered at 10:30 a.m. and 2 p.m. Monday-Friday and at 1:30 p.m. Saturday-Sunday at the Yale Visitor Center, 149 Elm St. No reservations are necessary. Private tours and foreign language tours are available for a fee by appointment. The Visitor Center is open 9 a.m.-4:30 p.m. Monday-Friday, 11 a.m.-4 p.m. on Saturday-Sunday. The Undergraduate Admissions Office also schedules tours for prospective students and their families. Click here for more information.